Are you looking for signage? Benelux Sign Systems can provide this. Signage is an essential part of our daily lives. Where to go, which exit, where to park, which route to walk… With the right signage you can attract people to your shop or company and point them in the right direction. Besides the fact that it must look beautiful, it also has an important function. Especially if your company is located in a place where it does not immediately catch the eye, well-placed signage can be a solution. Benelux Sign Systems supplies signage and offers various options. With us, everything is possible in terms of format, colour and printing. 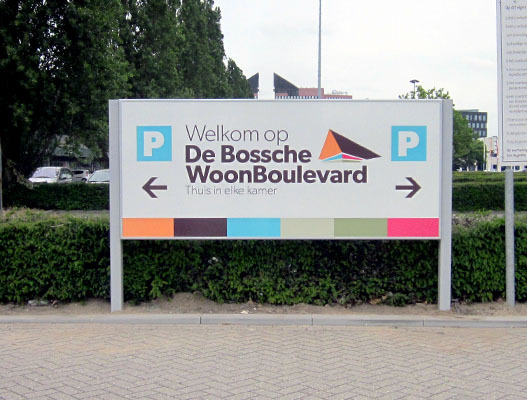 Would you like to buy custom-made signage from Benelux Sign Systems? Please contact us to discuss your requirements. We can inform you about our available options and draw up a quotation without obligation. If you agree with the offer, you can provide us with your design. Don’t have a specific design yet? We can help you with that. Once the design is ready, we will proceed to production. We only use high quality materials. Once the production of the signage has been completed, we will deliver it to you. And if required, we can help you with the installation. Benelux Sign Systems has been specialising in front lettering for some time now. For the last 35 years we have grown more and more into a professional specialist in the field of formula design and illuminated advertising. We maintain many long-term relationships with various customers and deliver beautiful projects to great satisfaction. Benelux Sign Systems can advise you on a design if you want to buy signage. We can create the design for you and produce it. If required, we can assist you with the installation. Want to know more about signage? Are you looking for signage and would you like to find out more about the available options at Benelux Sign Systems? Please feel free to contact us. We will be happy to provide you with more information. You can call us on (040) 283 69 30, or you can send an email or fill in the contact form on our website. Buy your signage from Benelux Sign Systems!